The meta title of your page has a length of 101 characters. Most search engines will truncate meta titles to 70 characters. The meta description of your page has a length of 329 characters. Most search engines will truncate meta descriptions to 160 characters. ჰელიუმის ბუშტები, heliumis bushtebi, ჰელიუმის ბუშტები იაფად, ჰელიუმიანი ბუშტები, ადგილზე მიტანით, heliumiani bushtebi, ჰელიუმის ბუშტები ფასდაკლება. Congratulations! Your webpage is not using any inline CSS styles. Congratulations! The size of your webpage's HTML is 5.85 Kb and is under the average webpage's HTML size of 33 Kb. Faster loading websites result in a better user experience, higher conversion rates, and generally better search engine rankings. Congratulations! Your webpage is successfully compressed using gzip compression on your code. Your HTML is compressed from 20.02 Kb to 5.85 Kb (71% size savings). This helps ensure a faster loading webpage and improved user experience. Your website loading time is around 2.64 seconds and this is under the average loading speed which is 5 seconds. 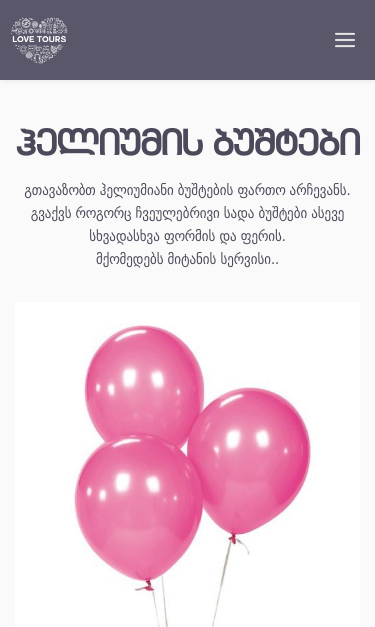 https://www.partyshop.ge/ka/category/heliumis-bushtebi and https://partyshop.ge/ka/category/heliumis-bushtebi resolve to the same URL. Congratulations, your website is using a custom 404 error page. By creating a custom 404 error page, you can improve your website's user experience by letting users know that only a specific page is missing/broken (and not your entire site), providing them helpful links, the opportunity to report bugs, and potentially track the source of broken links in your site. Your webpage is using the canonical link tag. This tag specifies that the URL: https://www.partyshop.ge/ka/category/heliumis-bushtebi is preferred to be used in search results. Please ensure that this specification is correct, as canonical tags are often hard-coded and may not always reflect the latest changes in a site's URL structure. Your web page successfully passed all high priority checks! Your web page successfully passed all medium priority checks! Your web page successfully passed all low priority checks! This SEO test will check if your website is using a custom 404 error page. By creating a custom 404 error page, you can improve your website's user experience by letting users know that only a specific page is missing/broken (and not your entire site), providing them helpful links, the opportunity to report bugs, and potentially track the source of broken links in your site.